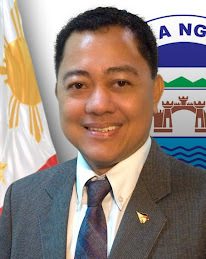 Olongapo’s three-termer Councilor, Edwin Piano, has been recognized as one of the Ten Outstanding Councilors of the Philippines (TOCP) by the Junior Chamber International Philippines and Senator Edgardo Angara at the Awarding Ceremonies held during the Philippine Councilor’s League End Term Conference at the Cebu International Convention Center, Cebu City last March 12, 2010. This, after beating all his contenders at the region and at the national levels with his exemplary track record as a legislator committed to uplift the sectors of labor , employment, technical education, telecommunications and information technology. “We are very proud of Councilor Piano’s success. This award only proves that the constituents have been right in choosing him as one of their representatives in the City Council, ” said Mayor James “Bong” Gordon Jr.
Councilor Piano, a former Subic Bay employee and one of the thousands of volunteers who protected and preserved the former Subic Naval Base under the leadership of Senator Richard Gordon, was first elected city councilor in 2001 and have authored and co-authored the highest number of significant resolutions and ordinances in the city council to date. The career of Councilor EDWIN J. PIANO can be described as a career characterized by hard work, legislative savvy and selfless dedication to public service. It is a shining example of how a Councilor’s innovativeness and practical skills can be successfully parlayed into the concrete enhancement of the lives of his constituents and the progress of his community and country. Believing that a councilor’s duties to the people go beyond mere legislative work, Mr. Piano voluntarily assumed other responsibilities that have a direct impact on the welfare of the community. He formally organized and led thousands of volunteers in rendering a wide range of community services. 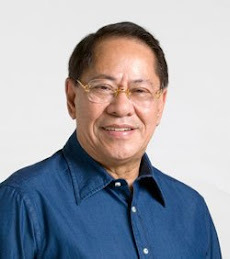 He set up and now heads the Olongapo Skills Development and Employment Center, while he is one of the pillars of the Subic Bay Information and Communications Technology Council. Mr. Piano is also very active in the scouting movement in Olongapo City. One of the Philippine’s Bests: Councilor Edwin Piano shows his trophy and plaque as The Most Outstanding Councilor in the region and in the Philippines. 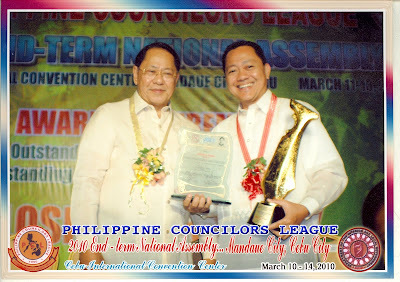 His national feat was conferred by the Junior Chamber International Philippines and Senator Edgardo Angara at the Philippine Councilors League End Term Conference in Cebu City last March 12, 2010. Cebu City (10 March) -- In just less than a week, President Gloria Macapagal-Arroyo will once again visit Cebu to serve as the keynote speaker during the opening ceremony of the 2010 Philippine Councilors League (PCL) End-Term National Assembly that kicks off tomorrow at the Cebu International Convention Center (CICC) in Mandaue City. This is her second visit for this month alone. Pres. 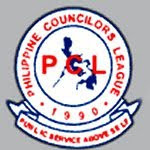 Arroyo is expected to arrive late in the afternoon and will immediately proceed to the CICC around 5:00 p.m. where she will be welcomed at the lobby by PCL National Chairman Councilor Michael B. Fernandez, PCL National President Councilor Victor V. Ferrer Jr., Mandaue City Mayor Jonas Cortes and Mandaue City Vice Mayor Carlo Fortuna as immediate past PCL national president. Prior to the President's speech, Mr. Ferrer and Mr. Fernandez will both deliver their respective short messages. An estimated 2,000 PCL officials, members and other guests have been invited to attend the three-day affair. Theme of the event is "Be Pro-Active, Partner on Climate Change -- Be a Leader." Presidential Adviser on Climate Change Sec. Heherson T. Alvarez is one of the resource persons and will talk on global warming and climate change on the second day of the assembly. With the May Elections only two months away, the participants will also be given updates and procedures on poll automation by Comelec-7 Regional Director Atty. Rene Buac also on the second day. The three-day event that will start tomorrow and end on Saturday will also highlight the Awarding of the 2010 Local Legislative Award and the Outstanding Councilors of the Philippines.